NEW YORK, New York — When the 11th Armenian Medical World Congress convened in L.A. this past July, one item on the agenda commanded audience attention as never before: HyeBridge Telehealth, one of Armenia Fund USA's ongoing projects. Dr. Gevorg Yaghjyan, a board member of Armenia Fund USA and the in-country project manager for the project, delivered a compelling presentation on the opportunities that telemedicine offers for Armenia and Karabakh. He mentioned that many specialties are likely to benefit from this satellite-driven technology, including preventive care, neonatal and maternity care, as well as pathology, cardiology and cardio-vascular treatment. He also referred to the new “smart” technologies as the second wave in telemedicine. This includes smartphones, tablets, and notebooks for professionals and consumers. It will open up even more flexible and cost-efficient ways for physicians to consult on cases when timeliness is key. As such, Dr. Yaghjyan stressed the importance of staying up-to-date with industry standards, and announced that Armenia Fund USA is planning on adding “mobile health” to its existing Telehealth services. Members of a newly formed group called the Yerevan State Medical University (YSMU) Alumni Association were present at the international conference. Given the growing number of graduates from (YSMU) who are now practicing western medicine as permanent residents of the U.S. or other western countries, HyeBridge Telehealth has particular appeal for them. It will give them a chance to share their practical medical know-how that they developed in clinical settings in the west with YSMU students and other alumni working in Armenia and Karabakh. 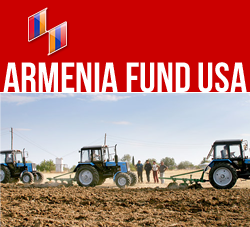 “This makes for a most unique relationship”, commented Irina Lazarian, the executive director of Armenia Fund USA. “The alumni from YSMU understand better than most how medicine is taught at YSMU and how it is practiced in Armenia and Karabakh. They are also fluent in eastern Armenian. This, no doubt, facilitates education and consultations within the Armenian reality. We look forward to involving this group as active participants of the HyeBridge Telehealth network. Dr. Gevorg Yaghjyan himself is ideally suited to oversee HyeBridge Telehealth as the in-country project manager. He was born and raised in Yerevan and is still a resident there. He is a physician, plastic surgeon, and associate professor. He received gold medal teaching awards from YSMU as well as the Drastamat Kanayan medal from the Ministry of Defense of Armenia. 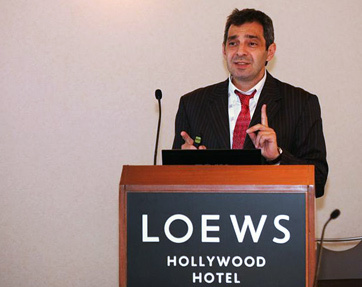 Dr. Yaghjyan's leadership in teaching is also a highlight of his career. From 2007 to 2011, he served as the vice-rector in graduate medical education with an emphasis on continuous medical education (CME). During this time, he established connections with all the chief doctors in the regional hospitals, including the military hospital in Shushi. At the same time, Dr. Yaghjyan has impressive credentials in western medicine. In the winter and spring of this year, he taught courses at Harvard Medical School, the Cleveland Clinic, Brandeis University and Yale Medical School. This past January, he became a Fulbright Scholar at the Boston University School of Medicine in medical education administration.